Hey there duo fans! 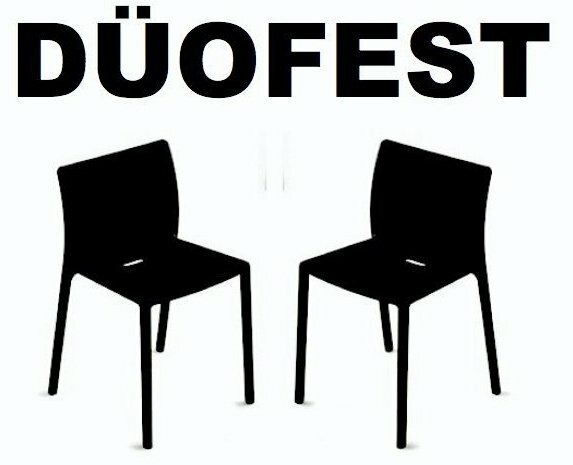 The wait is just about over… DÜOFEST kicks off this week, and boy oh boy are there some exciting pairings on board. The producers have put together quite an assortment, including local talent like Grimmacchio, Jessica Tandy, Matt&, BWP, Kristen & Amie Show, Suggestical and others, along with visitors the likes of Rachel & Dave, The Cascade, Trotsky & Hutch, Red Letters, Hodapp & Rothwell, Banana Breakup and a very exciting Messing w/ a Friend featuring Susan Messing joined by Christina Gausus. There will also be a number of special pairings that are either new, rarely seen, or assembled just for Düofest… like Jadico Fowler and Michael Loves Greg. Full festival passes are already sold out, and rumor has it that day passes are quite limited at this point. You can find out more details about ticket options at the Düofest website. Now, let’s get to the lineup!!! 11:02 pm: Evan the Loyal + Listen, Kid!